Coming in 2021 to Toronto's Liberty Village neighborhood, the Liberty Market Tower Condos located at 171 East Liberty Street will provide a comprehensive selection of unit layouts for prospective residents that place importance on luxury cosmopolitan living, vibrant concepts, and urban revitalization. The condo is being crafted from a figurative foundation that is a unification of the developer’s renown and passion, the architect’s expertise and skills, and the neighborhood’s culture and history. 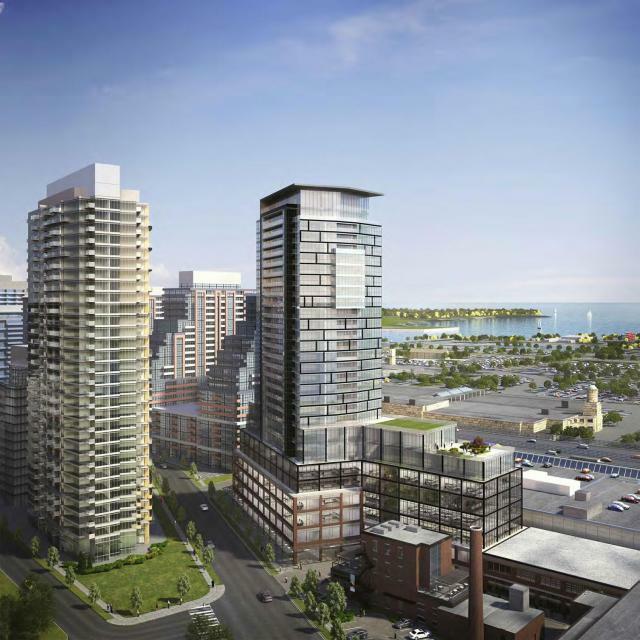 The initial plan for the development of the Liberty Market Towers put forth a proposal for a 32-story tower that contained at least 291 units. Since then, the floor plans have been amended, and as a result, the proposal as it stands now has been altered as well. The condominium will take the shape of a 28-story tower that is just shy of 100 meters tall. The ground floor will largely consist of retail space that will serve as a home to commercial entities. A significant portion of the space that makes up the 2nd to 7th floor will be designated as office floor space. The final floors – from the 7th to the 28th floor – will be designated for residential space and relevant amenities. In addition to all of this, the plans also encompass space that will be used to create 3 levels of underground parking. In total, the division of space based on usage will be: 18,004 square meters for residential space, 25,743 square meters for office space, and 13,345 square meters for retail space. Tentatively, it is expected that there will be a total of 283 residential units that will be made available at the Liberty Market Condos. This number will consist of approximately 29 3-bedroom units, 34 2-bedroom (including 2-bedroom plus den) units, 198 1-bedroom units, and 22 bachelor units. Pricing for all of the aforementioned unit types is to be announced, and prospective residents are advised to register now for Liberty Market Condo’s exclusive sales access the moment that prices are made available. When it comes to Toronto, mass transit facilities are the lifeblood that keep the city alive on a day-to-day basis. Keeping this in mind, everything from the exact location of the condo to the precise location of access roads and entrances have been meticulously calculated and planned out. The tower will be located at 171 E Liberty St., a central address in relation the surrounding transit options. The location also has a perfect walk score, which means that getting around on foot is incredibly simple and rewarding. In addition to this, Liberty Market Condominium is just a stone’s throw away from the local bus system and the subway station. Several major thoroughfares either bisect the area or they are located just a short distance away, like the Gardiner Expressway, King Street, and Queen Street. The state of the art amenities that will be made available at the Liberty Market Condo will be situated on 257 square meters of indoor space and 500 square meters of indoor space, all of which will be situated on the 8th floor of the structure. The comprehensive array of amenities that will be made available at the condo will include a cutting edge swimming pool, an intimate lounge area, an amicable party room, a state of the art fitness center, and convenient 24-hour concierge services. Parking space for automobiles and bicycles will be abundant and easily accessible. In fact, the Tower will feature approximately 329 automobile parking spaces, being made available in the aforementioned three levels of underground parking. Cyclists will also have approximately 324 bicycle parking spaces at their disposal as well. Businesses and commercial entities that are situated at the Liberty Market Towers will also have eight loading dock to facilitate their needs. 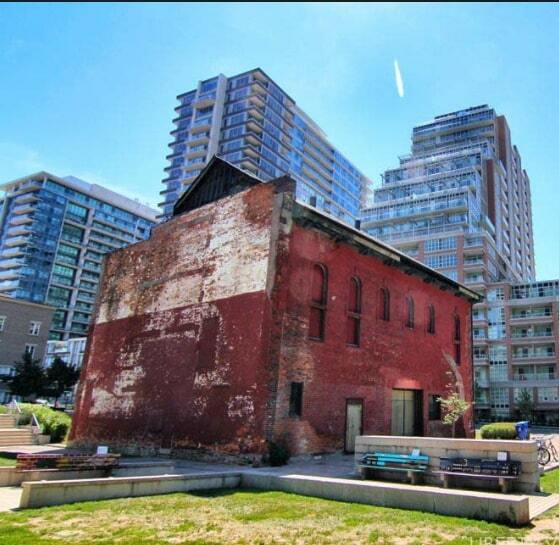 Liberty Market Tower is located at 171 East Liberty St., the heart of Liberty Village, a constantly developing neighborhood that is devoid of eyesores. Each and every building that lines the thoroughfares of this neighborhood not only has a purpose but it also looks aesthetically pleasing while doing so. Countless storefronts and office buildings make their home one the clean streets of Liberty Village, in addition to the ever-rising number of chic residential properties as well. 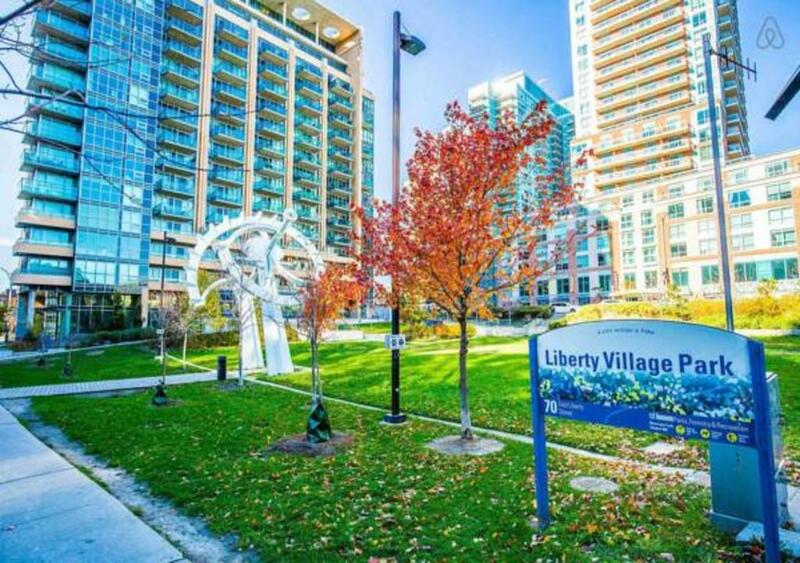 Liberty Market Condominiums' surrounding area enjoys its close proximity to the nearby Toronto's Entertainment District, taking advantage of the entertainment venues, clubs, hangout spots, and bars that can be found there. Liberty Market Tower Condos is a joint effort between Lifetime Developments and Wallman Architects that has given birth to one of the most paramount mixed-use buildings that will have ever graced Toronto’s skyline. The perfect blend of contemporary features and amenities and artistic designs that celebrate the area’s history has undoubtedly created a development that will foster growth in the neighborhood for years to come.